Update: The RMT have now confirmed that next week's strikes are suspended. The planned tube strikes for next week could be called off. 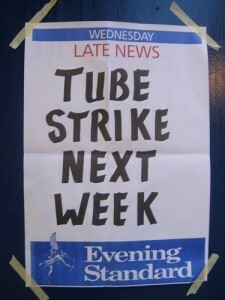 TfL said that the strikes will be suspended following a deal with the RMT. But confusion ensued when the rail union said they had yet to officially announce the climb-down. The deal was the result of secret discussions between the two warring parties. It will see the reinstatement of one of the sacked drivers in a different role, and more discussions around the other driver. It also includes a pay increase, bonuses for staff working on projects related to the Olympics and agreements over future industrial action. London mayor Boris Johnson is under increased criticism over the latest round of strikes along with his ongoing refusal to meet with union bosses. He now appears to be blaming the government for their failure to introduce anti-strike legislation.